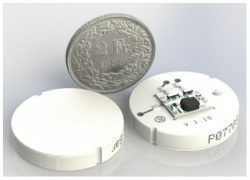 Pressure sensor elements with sensing diaphragms made from alumina ceramic (Al2O3) for electronic & mechanical oem integration into measurement & control instrumentation designs. 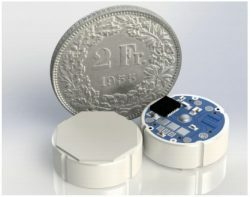 These compact coin sized pressure sensing capsules can be specified to measure ranges from 0…60 mbar or 24 inH20 up to 0…800 bar or 11,600 psi. 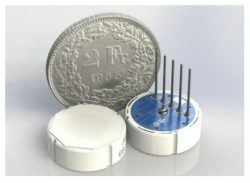 The basic ceramic hockey puck versions have no signal amplification and will provide a core transducer signal of either a wheatstone bridge strain gauge ratiometric millivolt output or a capacitance difference signal output. High corrosion protection from acidic or alkaline solutions. 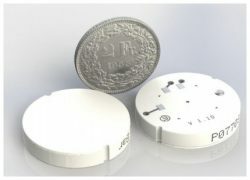 These disc shaped pressure sensor elements are made from 96% pure alumina ceramic which unlike many metal based sensors, is chemically inert and therefore unaffected by most corrosive substances. Alumina Ceramic (Al2O3) has excellent chemical corrosion resistance to many aggressive gases, solvents and acids. 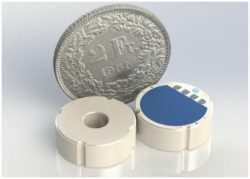 No additional protection is normally required to protect the sensor diaphragm from the measurement medium. 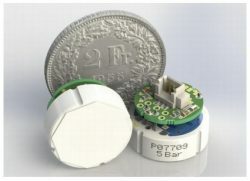 The active sensing element, compensation trimming, electrical contacts and mounting components are all incorporated into one homogenous low profile circular design. No welding or adhesive bonding is required to mount these pressure sensor capsules. This leads to a low cost assembly without requiring any specialised manufacturing processes. Permanent seals can introduce performance changes due to the settling of welds & bonds over time, as the pressure transducer is pressure cycled and exposed to temperature variations. Simple construction with either thick film strain gauge or variable capacitance type sensing technology. 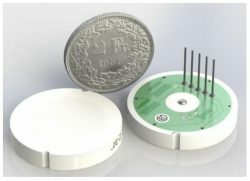 Ceramic is a natural electrical insulator so that can also act as a substrate for adding laser trimmed resistors to tighten output tolerances without the need for incorporating a separate PCB assembly which adds size, cost and complexity to the pressure sensors clean hockey puck shaped design. 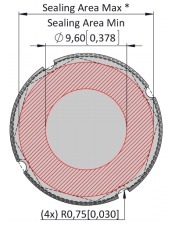 The outer area of the ceramic disk is thicker than the active sensing area in the middle, so that it can be used to seal on an elastomer o ring and reduce diaphragm deflections caused by mounting stresses. 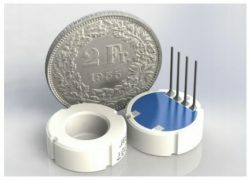 The variation in thickness of the monolithic piece of ceramic makes it possible to incorporate a thin pressure sensing area for overlaying the strain gauges and a thick outer section which is sufficiently rigid enough to be used as a sealing surface and diaphragm mount for the thinner sensing area. 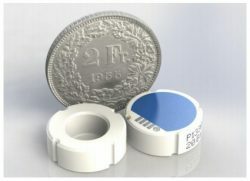 The hockey puck shaped style of ceramic pressure sensing capsules is much shorter than other pressure sensing technology which incorporate a silicon strain gauge element into an oil filled glass to metal seal capsule. 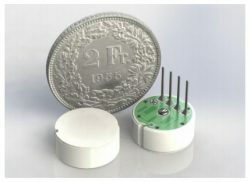 These flatter ceramic pressure measurement devices can be used inside instruments with much shallower and narrower space requirements, where button seal type capsules with vertical pin feedthroughs would not fit. 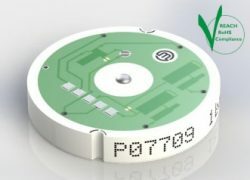 Since the electronic contacts are soldering pads located on the ceramic surface which makes it possible to connect wires parallel to the flat surface without any appreciable increase in assembly height. 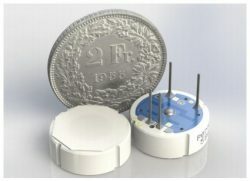 These ceramic pressure sensor modules are manufactured to standards to ensure compliance with REACH (Registration, Evaluation, Authorisation & restriction of CHemicals), RoHS (Restriction of Hazardous Substances) and Conflict Mineral Free. 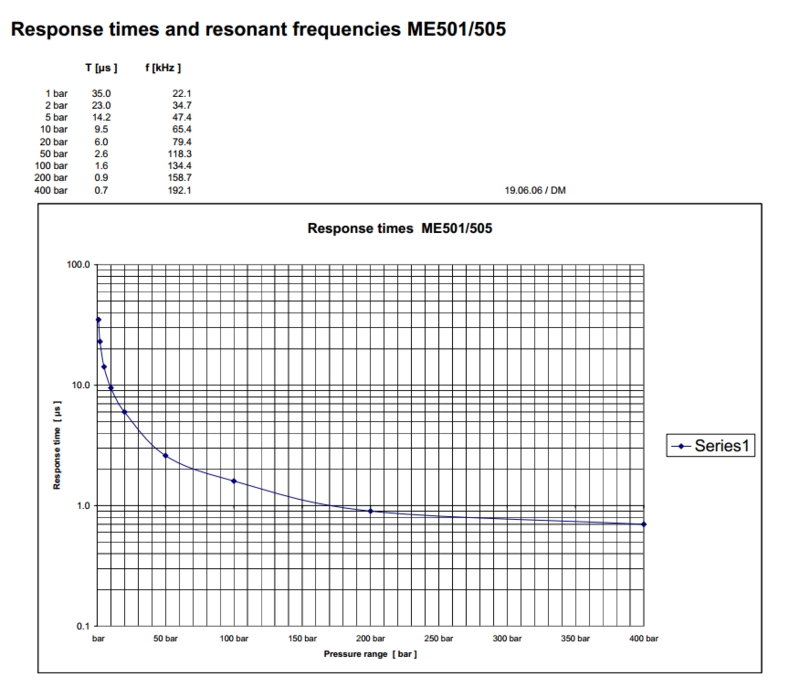 This graph shows how the output response time to an applied pressure varies by pressure range for the ME501/505 type series. 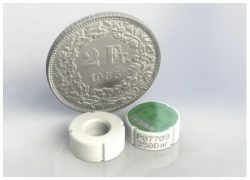 The ceramic piezoresistive pressure sensor capsules are made with a ceramic base plate and a flush diaphragm and work following the piezoresistive principle. The Wheatstone bridge is screen printed on one side of the flush ceramic diaphragm which is, in turn, glued to the sensor’s body. The bridge faces the inside where a cavity is made and the diaphragm’s opposite side can therefore be exposed directly to the medium to be measured. Monolithic pressure sensors are made with a ceramic cell and work following the piezoresistive principle. The Wheatstone bridge is screen printed directly on one side of the ceramic diaphragm by means of Thick Film technology. Due to the reinforced outer area (monolithic structure), the sensor can be mounted directly in a plastic or metallic case by using O-ring. 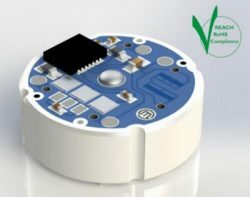 Variable capacitance pressure sensors are made with a ceramic base plate and a flush diaphragm and work following the capacitive principle, in which the pressure measurement is given by the variation of capacitance due to deformation of a capacitor’s plates. 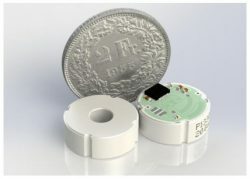 The moving capacitor plate is screen printed on the flush ceramic diaphragm which is, in turn, glued to the sensor’s body. 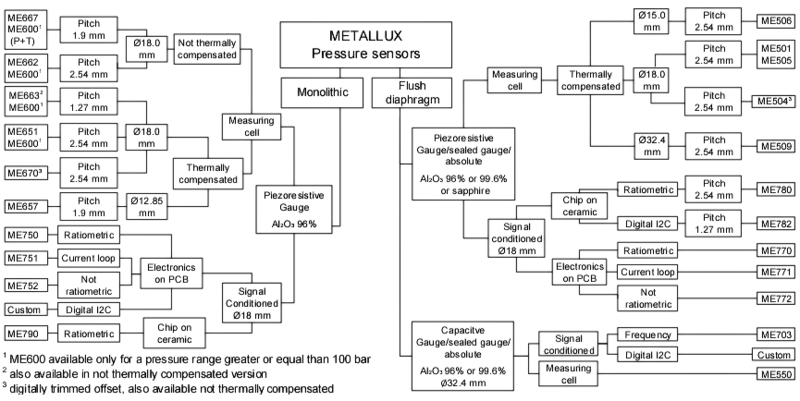 The capacitor plate faces the inside where a cavity is made and the diaphragm’s opposite side can therefore be exposed directly to the medium to be measured. Sensor’s vent hole is protected against humidity and dirt by a special filter glued to the ceramic cell (PCS). The wide diameter (32.4 mm) and the use of the capacitive technology make the ME550 a sensor suitable for measuring very low pressures, as low as 60 mbar. 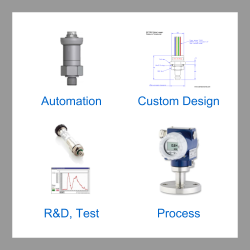 Nevertheless, these low range pressure sensors feature a high burst pressure, making them quite reliable in many applications. 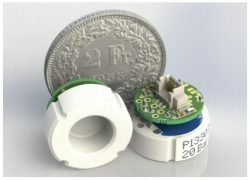 The pressure sensor cell mounting kit his intended to reduce initial cost and development time for mounting a ceramic pressure transducer diaphragm module into a sensor housing, in order to help the design engineer quickly test the features of the pressure sensor cell or signal conditioned pressure sensor modules. The KIT0400 includes a steel housing (two parts) plus 5 kantseal FKM DKAR 00014 V9004 O rings, for repetitive assembly operations. During the assembly of the ceramic cell in its housing, it is very important to observe the correct closing torque to prevent any unnecessary mechanical stress on the ceramic element. Send us your enquiry for a product associated with this Ceramic Pressure Transducer Cells for OEM Design page, and get assistance with selecting a product for your application.